Homeowner Review of Wood Floor Repair and Refinish. Journeyman Floorwright, Jerry Adamsson, restored our engineered kitchen wood floor to its original look, or maybe just a bit darker than the original to match our cabinets more closely. Did you find any surprises and how did your Floorwright handle them? We moved our fridge, range, a wall-unit with attached desk, and our kitchen table. We did discover some discolored areas; the consequence from spilled water that wasn't wiped up in a timely manner. Jerry was quite confident our floor was going to be a success after the Monocoat refinishing, and his optimism was shared equally between my spouse and me. Jerry almost predicted the outcome and the before/after was a night and day difference! It looked that good, maybe even better than when it was originally installed some twenty years ago! The only negative is that the finish is somewhat flatter than we expected. Jerry suggested I mention that in this reply so we can hear what Monocoat might suggest for getting a satin like finish to our floor. What effect has your Floorwright had on your property's value, your floor's future, and is there anything else prospective Floorwright customers should know? 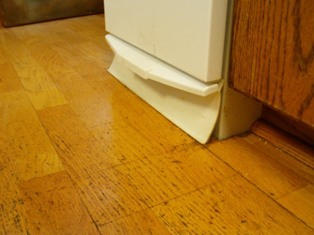 As we update our kitchen in small increments, our floor is one item we won't have to deal with for quite some time. Thank you, Steven, and I'm sure others thank you, too. Especially those folks wondering if their engineered or laminated wood floor can even BE sanded, as well as those who have heard about Monocoat and were wondering about the sheen. the factory sent you when it was installed. You guys picked a great color--just a little lighter than your cabinets, just a little darker than what you used to have. Your pre-finished engineered wood flooring, in fact, came with a factory polyurethane finish on it years and years, ago. Probably semi-gloss, to hit the middle. the curing process of the poly from a liquid to a solid can peel the less than 3 mm wearlayer from its substrate, usually plywood. We call this delamination. Monocoat eliminates the possibility of delamination because it molecularly bonds with the wood cells, not to itself, leaving nothing on the top to cure. Traditional floors that have been over sanded through the years, can be just as thin or thinner and are good candidates for Monocoat, as well. 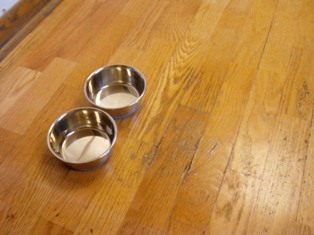 Monocoat floors do have a sheen, it's just very soft, very natural. In fact, the sheen is the wood, itself, and not the Monocoat. Can you make a Monocoat floor shinier? And that goes for any wood floor finish, be it a hardening oil, penetrating oil and wax, or poly. Weekly, or as needed, you will want to wash your Monocoat kitchen wood floor with Monocoat Soap or Monocoat Soap Satin. Both clean Monocoat safely. The Soap Satin actually builds up on the surface to achieve a satin sheen, as the name implies. I recommend trying both to see what you prefer. 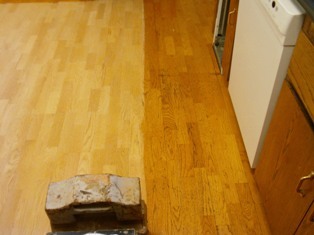 Once or twice a year, in a busy kitchen, Monocoat Maintenance Oil should be applied to the floor. 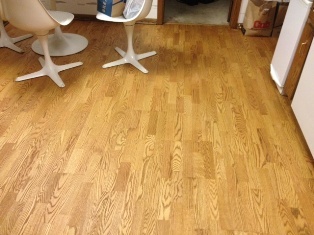 This product rejuvenates the existing color in the wood. This is NOT the product you use when the color is gone, however. refinishing process--2 Pure, 1 Dark Oak-- to make the touchups and then return to your normal daily, weekly, monthly, annual routines. Here's to the longest life of your wood floor, as well as you and yours!